My stylist is amazing and had no issue with me going after it. She recommended the supplies and picked a bleach that has a built-in toner to stop my hair from going too brassy. 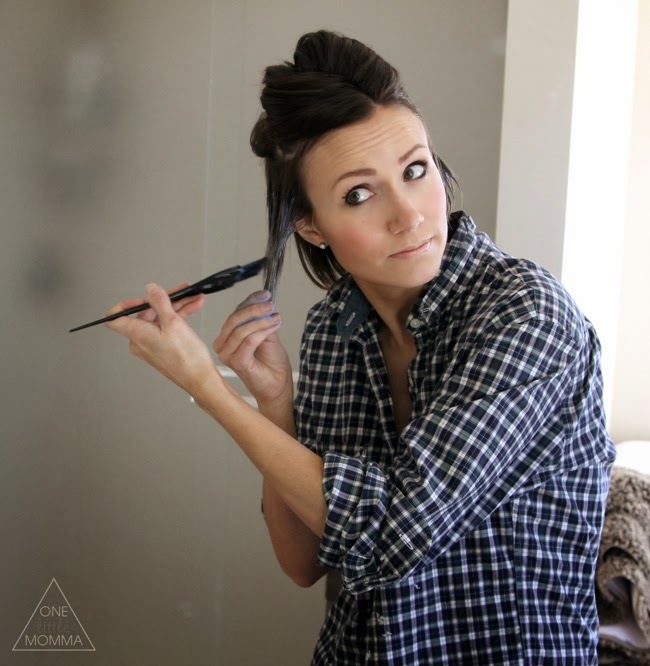 I have no formal cosmetology training, so I have really struggled with posting this tutorial. This is what has worked for me and what I currently do, but I know my own hair, and I've learned from a lot of trial and error. I would hate for anyone to try this tutorial and fail. Please, please be super careful with your hair and don't expect this to be a magic formula. I may be a pretty regular gal, but I've practiced a lot, and honestly I still get nervous every time I lift my hair. 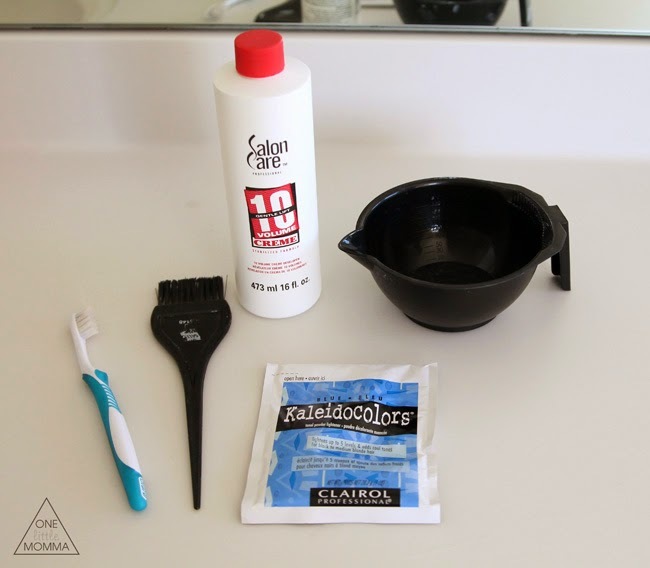 That being said, if you have colored your hair before or you are willing to learn, I think you can do this. It helps to have a knowledgeable friend or a even a hairdresser that empowers you like mine does. The benefit to me never having had formal training is that I am willing to do things "wrong" to get the result that I want. I want my hair to look painted and well-blended. It only makes sense to me to paint on my color and let it develop so that it blends. I hope this tutorial helps and please, please don't try this at home unless you absolutely must! To start, I mix my bleach powder with the developer. Each time I lift my hair, I use about half of an envelope of powder. The mixture is a 1:1 ratio and should be mixed well. I always wear a grungy button up when I color and have shampoo and conditioner ready. You can see the consistency of the mixture below. It is pretty creamy, but more like thin frosting than thick. 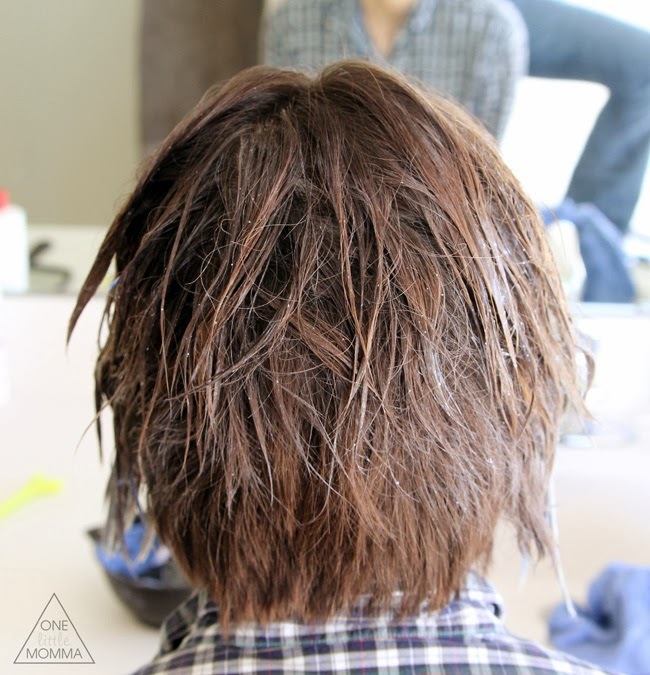 I begin with dry hair, and before I color, I look at my whole head to see where I want to lighten—in the front, in the back, and on the sides. 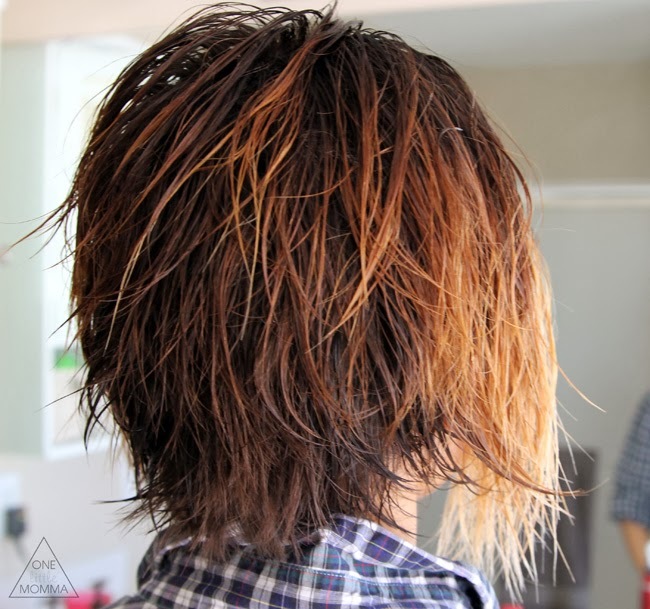 For this color/bleach, I wanted to bring the lighter tones higher and wrap them around the back on the top layer. Because my cut is stacked in the back, I didn't want to lighten the entire back. I only wanted to lighten the ends of the top, longer layer where it made sense. 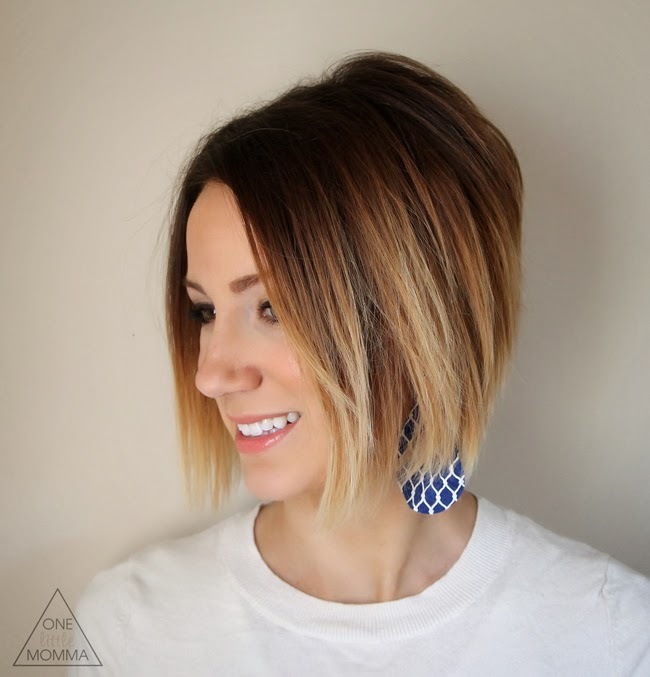 I clip up half of my hair and start with the lower layer, beginning in the front and working back on each side, using the brush to apply. I work the bleach into my hair from the tips up. Although I know it is terrible for my skin, I color with bare hands. I can tell that it is harsh on them, but bare hands are the best way for me to feel where I am coloring and even help to blend the color in. With gloves I wouldn't have the advantage of feeling where I have applied and where I need to add more. You don't want to get the bleach on your face though. I have bleached spots on my cheek multiples times. It removes your self-tanner, and it burns! 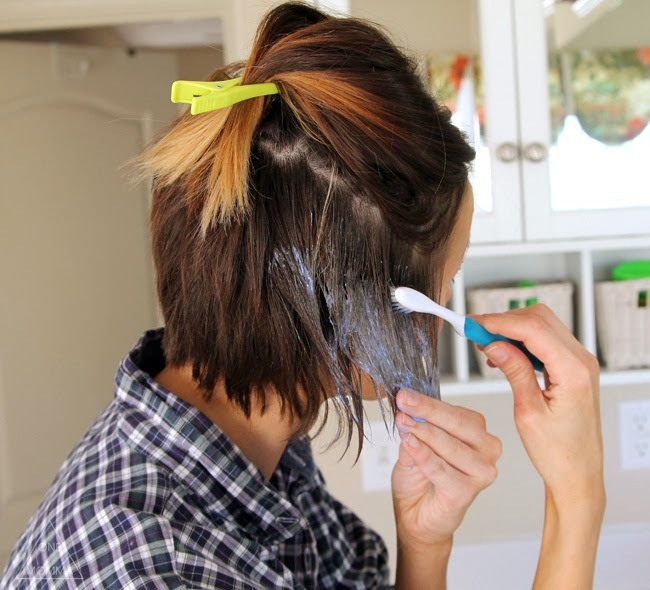 Once I have the bleach applied with the brush, I go back in with a toothbrush and blend the bleach into my hair. 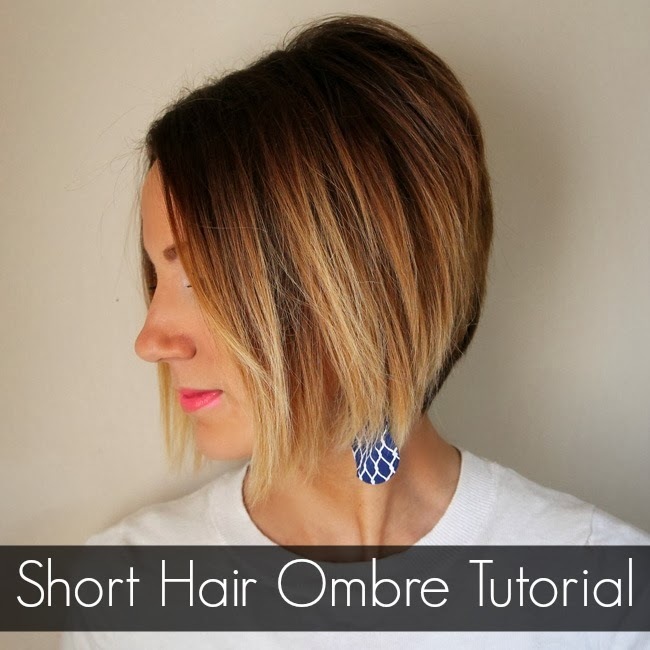 The most important thing with ombre is to avoid a harsh line. I blend, blend, blend with my hands and the toothbrush. Once I am satisfied that it has been blended and well applied, I move to the lower layer of the other side. I work pretty quickly because the color starts developing as soon as you start applying. You want the color to develop evenly, so it is important to get it on in the same time frame. I let down another section of my hair and apply color to it. I say color, but I mean the bleach. This solution is lifting away color, not adding any in. When I start a new section, I apply the bleach pretty thickly because I blend it in with the toothbrush and applicator brush. 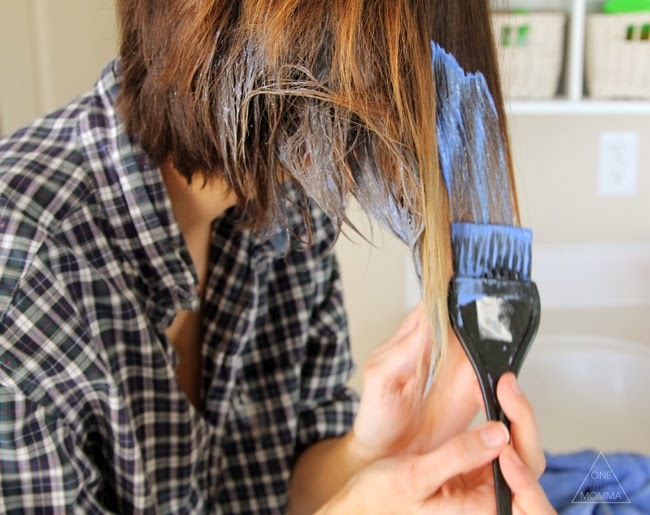 The ends need to be completely coated, whereas the middle needs to be less coated to achieve the ombre look. I finally let down all of my hair and do the top layer. This is definitely the most important part to blend well. You don't want any spots from heavy drops or lines from bad blending. I redo my ombre every two months or so and usually after I get my hair cut. Because my hair is already ombre, I only have to pull the bleach up higher on my head once, and it lightens the virgin hair a little while bleaching out my ends. The first few times I ombre-ed my hair, I had to do it multiple times. I started with just bleaching the bottom two inches of my hair. Then I had to do it again with four inches instead, and it created the ombre look by dying the ends twice and the middle once. It definitely fried my hair a bit and it took practice, but it was worth the risk to me. Like I said I use my hands a lot. (BAD, I KNOW!) Once I have applied the color to the places I can see, I will go back in and feel the back of my head and look with a mirror. Often I take some of the leftover bleach and rub it in to blend the front/side hair with the back. Or I will lightly brush it across the tips of my hair in the back. 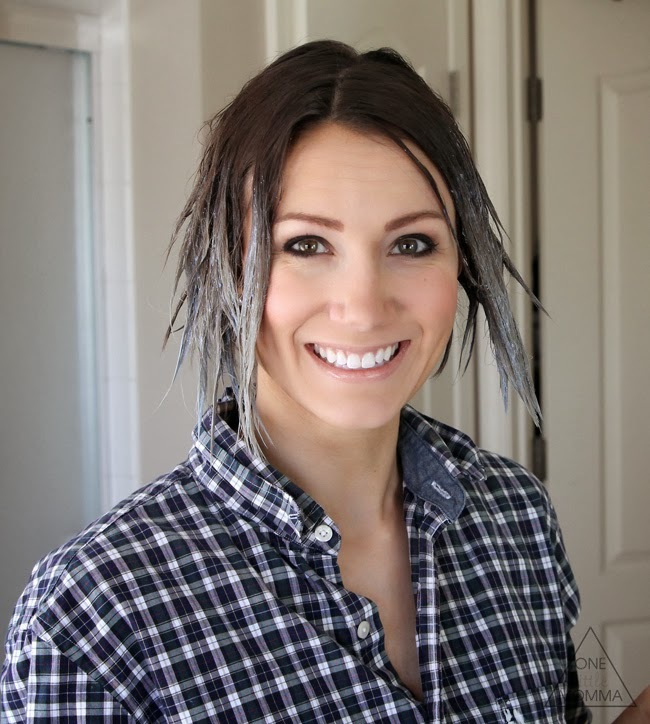 The idea is to "paint" your hair so that it subtly changes from dark to light. 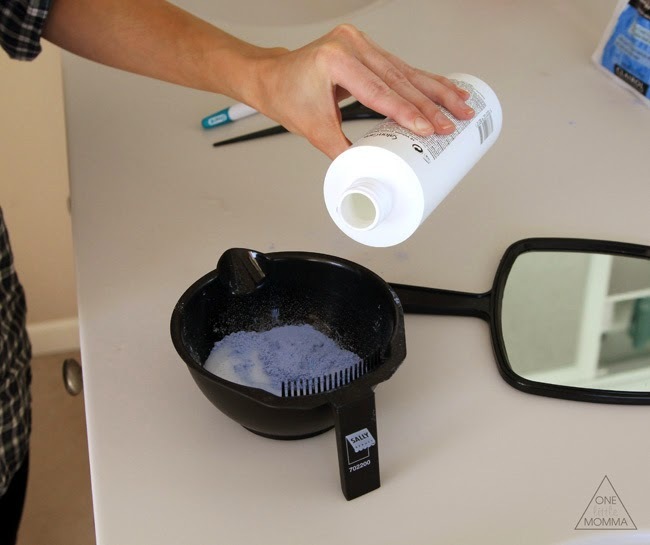 Heavier application makes for more drastic changes, so go light towards the top and heavier on the ends. You can see from here that the back is not heavily coated AT ALL. It is very lightly brushed on in the places that make sense so that things blend. The product really develops with heat and stops developing once it dries. 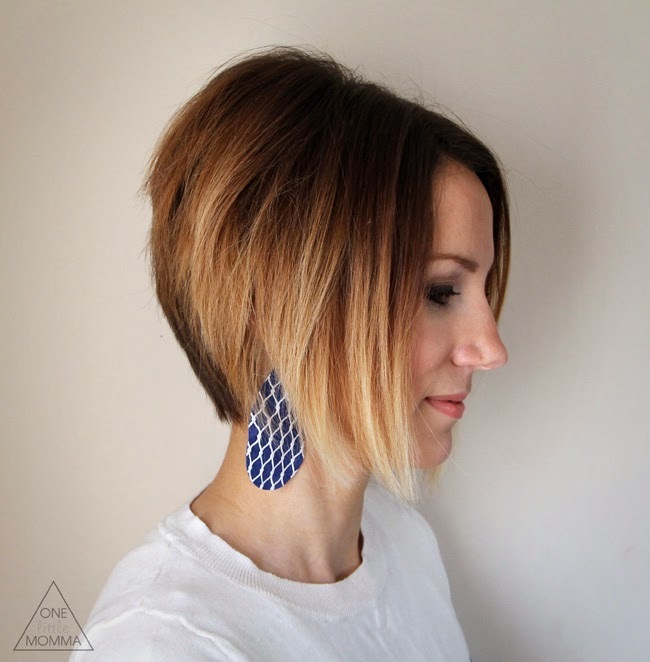 I am always nervous when I lift my hair, so I opt for less heat and less time in my hair. 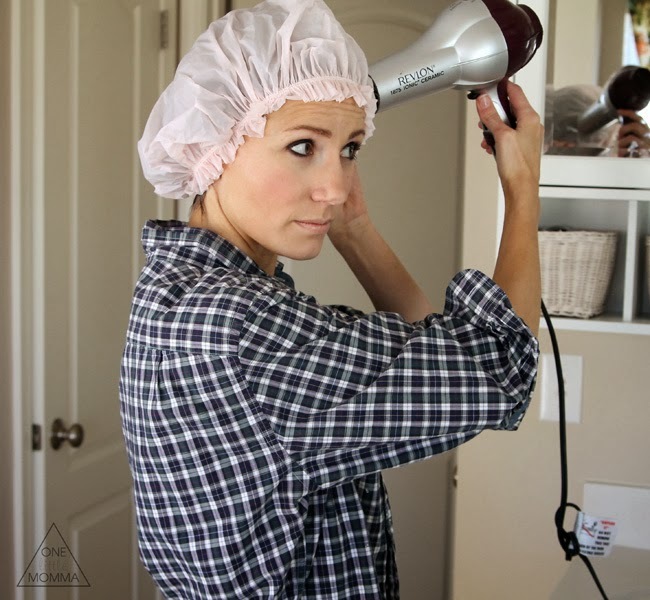 I usually will put on a shower cap after I finish applying the color and blast my head with a blow dryer on high for about five minutes. I leave the color on for 20–25 minutes from when I first start applying or until I can see it changing. I ALWAYS opt for less time rather than more because I never know how it will turn out. I know I can always lift my hair again, but I can't very well undo any spots or lines that develop from leaving it in for too long. Once I can see the color has changed, I promptly wash and condition. You can already see the color is lighter even with my hair wet. I should wait for my hair to dry a little, but I am always too anxious to see how my hair has turned out. I usually style it right away. You can see my everyday styling tutorial here. And that is it. Hopefully there aren't any mistakes and everything blends well. Like I said, if I were doing my ombre for the first time, I would go back in and lighten about halfway down a second time. The first application would be to get the middle tones, and the second would be to get the blond ends. In the past, I have also brightened my ombre and covered some random gray hairs by coloring my roots darker. Rather than bump up the brightness on the ends, I'll darken my roots. 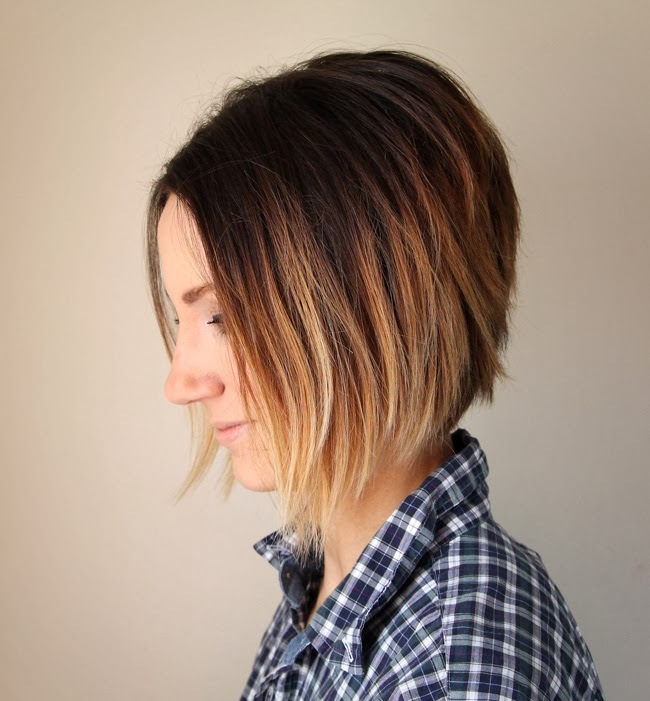 To do this, I will pick a demi-permanent color that is close to or a tiny bit darker than my natural shade. 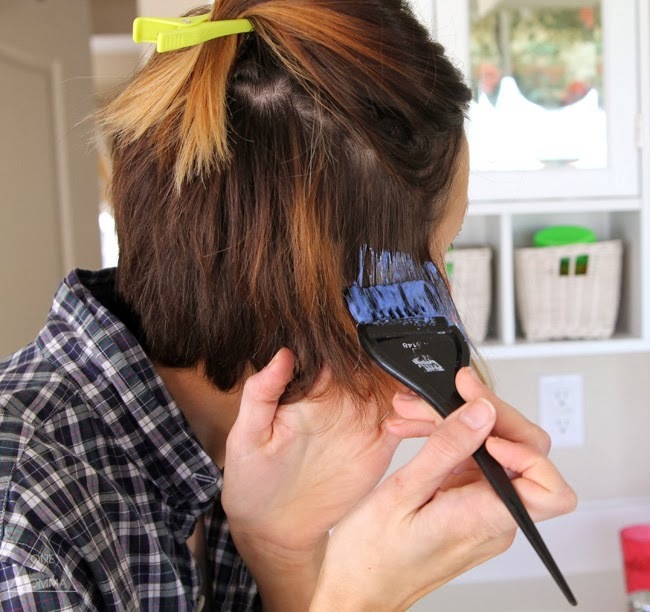 Then I apply the dark color to my roots and blend the color down with a toothbrush about two to three inches. Follow the instructions on the box for mixing and how long to leave it in, but if you already have light hair, this might be a good option for you. Go a shade darker than your hair and color your roots rather than your ends. Just be sure to BLEND it well! I hope I managed to answer all of your questions and cover the basics. Please feel free to email or comment with questions. I'll do my best to answer them! How do you feel about ombre? Have you embraced (or do you want to embrace) it? thanks! I also don't love that harshness of the regular ombré but love this- I might try this for summer! I think your hair looks great. And I would never have guessed that you do it yourself! It looks professionally done. That said, I'd never DIY. Yikes. I tried that once...right after the twins were born. I was jonesin for highlights + lowlights bad and tried it and omg...it was awful. I didn't get it all the way to my roots and it was not blended and I ended up going in to have it fixed. I have to admit, as a hairstylist, I assumed this post was going to make me mad....I thought "oh great, she's gonna have all her readers fry off their hair!"... But I loved your disclaimer on how this is what works for YOU and for people to be careful with their hair. I also like that you only use 10 volume developer, which is very safe. I am always ok with clients coloring their own hair with color from Sally Beauty. As long as they stay away from drugstore box color. One suggestion I would have for readers: while some people look great with the warmth in the tone of your ombre, others have the skin tone to need a toner to cool it down a bit. So I would suggest a violet toner, which can also be found at Sally...just apply to damp hair for a few minutes after you rinse the bleach. 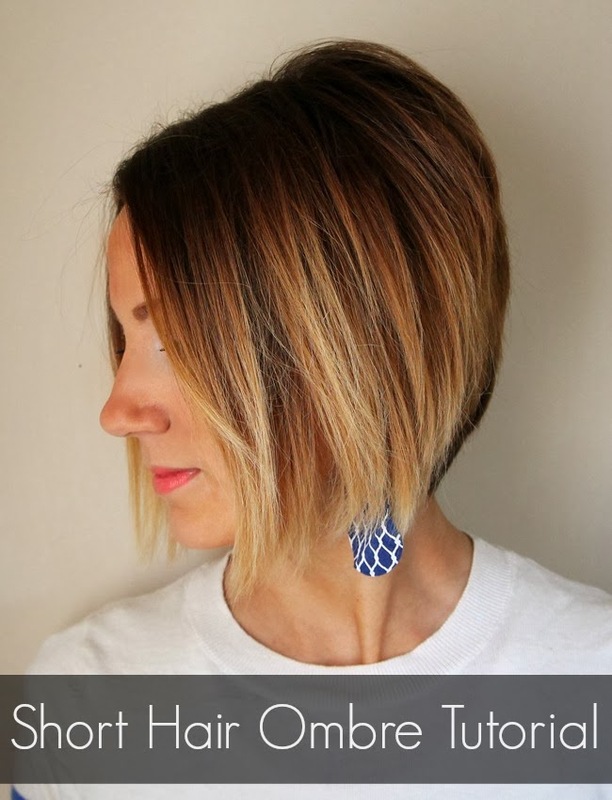 Another recommendation I have is to get your hair trimmed AFTER you lighten your hair, it gets off the dry ends you may have damaged during the bleaching process. I love you hair! I would have never thought you did it yourself. Kudos to you. I recently had my hairstylist ombre' my hair and I was a little disappointed at first. It is not as light as I wanted by we have to break through the color (box color). I also wish she blended it better. I will go back later this month and see if we can fix it to blend better and hopefully break through the box color to be lighter. Thank you for sharing but I know I am not brave enough to try and tackle this on my own. This is awesome!! As a fellow beauty DIY-er myself, I love learning new tips, tricks, and finding out about new products. 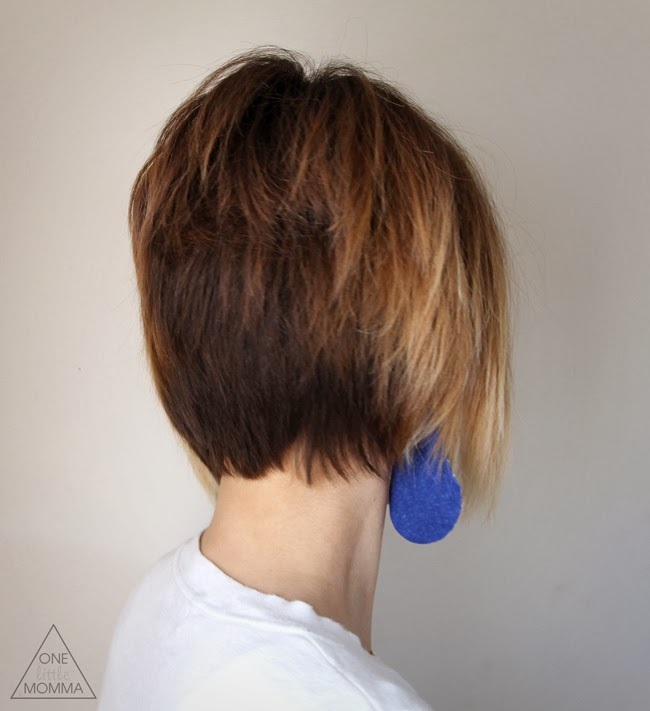 I want to try this and have a similar hair cut, though grown out a bit. My big question is whether 10 volume will work for me. Usually my stylist has had to use 30 for highlights! Maybe I should break even with 20...? I'll investigate. I agree with Alysia! Great detailed tutorial!! Love the toothbrush to blend! Sounds like you have a great stylist! I still remember when I lightened your hair and how entrigued Soren was!! Love your hair!! So pretty! 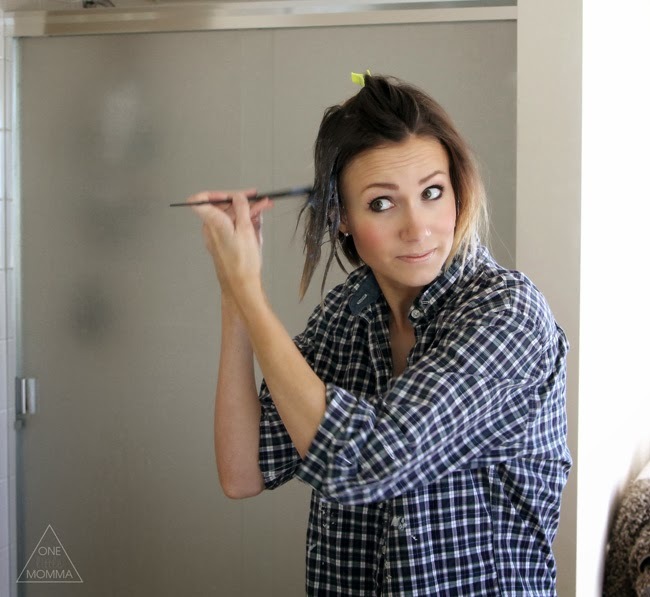 I justtt discovered your blog and I am in love with your style (and hair)! Keep up the good work! Love this. 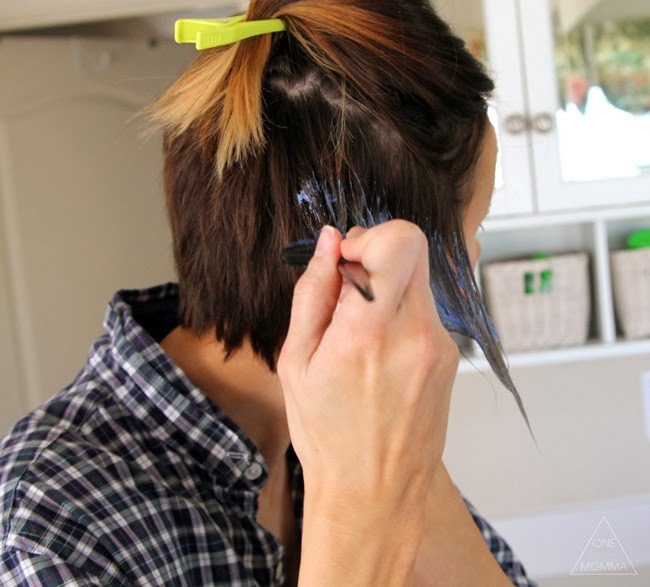 I kind of want to do this with blue (my hair's a medium-dark brown). So flippin cute. So how many times did u repeat this and how often till u got the end results? My hair is naturally dark brown. And I'm doing it as we speak. Just curious. Great tutorial! 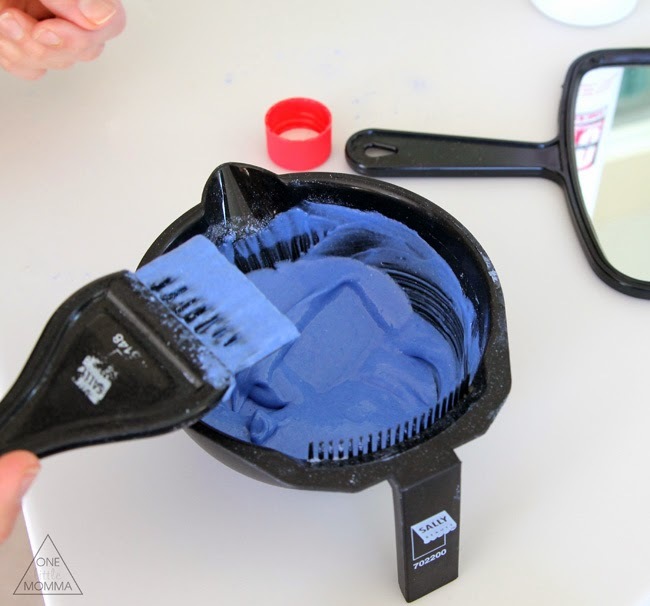 Never thought of using a toothbrush, I'll use it when I re-ombre my hair! How long did you wait after bleaching the first time to do it a second time? And also, were you able to achieve the blonde colour after only bleaching twice when you first started? I love your hair! I'm trying it for myself, so thank you so much for the tutorial! I usually bleach it again the same day. It definitely took more than twice to get the look you see above. But it's all about a gradual change in color so you can try it again and a few weeks if you want more blonde or a bigger contrast. Hi Kilee! First of all, thanks for the detailed tutorial. I just have one question: what is your base haircolor? Love and enjoy your blog. And congrats for your preg. Beautiful! May I ask what is the name of the colourshade of your hair?